The Minotaur 1 rocket that will launch the ORS-1 satellite into orbit at Pad OB at Wallops Island, Va., in June 2011. 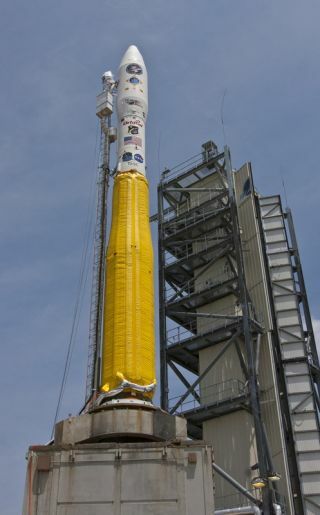 The yellow blanket provides thermal protection for the first and second stage prior to launch. This image was taken June 27, 2011. UPDATE for 6:12 p.m. EDT: As feared, bad weather thwarted the first launch attempt of a Minotaur rocket carrying the ORS-1 satellite. The next launch try will occur Wednesday, at 8:28 p.m. EDT. The United States Air Force is planning to launch a new tactical reconnaissance satellite this evening (June 28), to help deliver fast, accurate information to warfighters on the ground. The satellite, called ORS-1, is slated to blast off atop a Minotaur 1 rocket at 8:28 p.m. EDT (0028 GMT) from a NASA launch range at the Wallops Flight Facility and Mid-Atlantic Regional Spaceport in Virginia. The spacecraft is outfitted with a customized version of the SYERS-2 sensor — advanced snooping gear that's also carried by the Air Force's high-flying U-2 spy planes. The reconnaissance satellite will be the first for the Air Force's Operational Readiness Space (ORS) office, which was created in 2007. It costs a reported $226 million, according to Spaceflight Now. "The inaugural flight of the ORS spacecraft is historic, and even more important is the significant capability it will provide to the warfighter in the next year," said ORS director Peter Wegner in a statement. If the sunset rocket launch goes off as planned tonight, skywatchers in much of the eastern United States could get quite a show. However, Mother Nature may not cooperate; forecasts call for scattered thunderstorms around the launch site, with only a 30 percent chance of good weather, NASA Wallops officials have said. The new satellite's SYERS-2 is the Air Force's most advanced intelligence, surveillance and reconnaissance sensor, according to the Goodrich Corporation, which built it and integrated it into the satellite. The sensor provides high-resolution imagery day and night, and it can peer through haze and light fog. The satellite will beam information gathered by the modified SYERS-2 sensor down to Earth, where analysts will take a look and send relevant data along to the military's Central Command for nearly real-time use by warfighters. The ORS office has been charged with developing low-cost, rapid-reaction satellites and payloads to meet joint military needs for on-demand space support, Air Force officials said. ORS-1 is an example of that rapid reaction; it went from design and development to the launch pad in 32 months. "To develop, construct and launch an operational satellite in 32 months reflects the dedication, determination and diligence of the entire ORS-1 team," Wegner said. "I'm confident that hard work will continue during launch and through the scheduled mission, which will provide the deployed warfighter with enhanced situational awareness to help protect them from harm. It's a calling we are proud of." NASA will provide a live webcast of the launch here, with audio updates on the radio station WCTG, 96.5 FM. If today's planned flightoccurs as planned and you snap an amazing image of the sunset rocket launch that you'd like to share with SPACE.com, please contact managing editor Tariq Malik at: tmalik@space.com.